EPL Index > Chelsea (NN) > What would an Andre Villas Boas Tottenham Hotspur look like? What would an Andre Villas Boas Tottenham Hotspur look like? With the high probability of Andre Villas Boas becoming the new Tottenham Hotspur manager in the near future, so much so that mybet bonus code were not giving punters much in the way of a return. TPiMBW has taken an objective step back from his recent Chelsea venture to analyse just how Andre Villas Boas proposes that his teams play their football. English Premier League fans may be aware that he possesses facial hair styled to perfection and presents himself as the immaculate gentleman, but his time at Chelsea didn’t present him with the opportunity to get his concepts across – Tottenham however, is a whole different proposition. What to expect: André Villas Boas is a manager to believes that the strength of his team is focused around a particular system and as we saw at Chelsea, is a manager who is consistent with his proposed style of play, even through poor spells. But don’t write him off just yet, to judge him on his Chelsea performance would be unwise. With the ball: AVB prefers his team to be patient in possession and ‘pick the lock’ at the right moment. One of the key factors for his failure at Chelsea has often been suggested that AVB was lacking a creative midfielder, one just like Modric. A breed of creativity and flair that was also present in his Porto side through the talent of Joao Moutinho. André Castro was Joao Mouthinho’s understudy at Porto and under the supervision of Villas Boas appears to have become a play-making clone of Mouthinho. Villas Boas has also demonstrated at both clubs he likes to play a formation with two dynamic, fast and goal scoring inside forwards/wingers. Sturridge and Mata were instructed to take up these roles at Chelsea and both did a reasonable job at adapting to AVB’s ideologies, however neither are naturally players positioned on the flanks. At Porto AVB boasted the skills and pace of Varela and Hulk, two players that Lennon and Bale are more than a match for, two game changers. The basis of AVB’s strategy is that when his side are in possession, the pitch is made as big as possible by spreading the formation out wide and utilising the space created by getting the wide men on the ball as often as the centralised play-makers. AVB is clearly a firm believer in the old footballing proverb that ‘possession is nine-tenths of the game.’ The logic behind this belief is twofold. If you have the ball, the other team cannot score and secondly, if your team have the ball the opposition become exhausted chasing you down. This therefore has two desired effects, one is that the opposition are so tired than upon winning the ball from you, they are easier to press and tackle in the following moments of play; secondly, their attacks become slower and a lot more predictable: either through a resort to long ball or the struggle to retain possession and get a foothold in the game. ‘Keep ball’ has the potential to act as a virtuous cycle. Without the ball: AVB presses high up the field and is unlikely to sit back against anyone, not even Man City or United. One particular issue at Chelsea was that of a slow back line and it would be fair to say they failed to cope with defending any immediate counter attack. AVB conducts his team in this way so that the pitch is made as small as possible for opponents: by squeezing up the back line and using the off side trap aggressively – the opposite to when in possession. This tactic requires quick defenders to successfully cope with any threat of the long ball over the top. 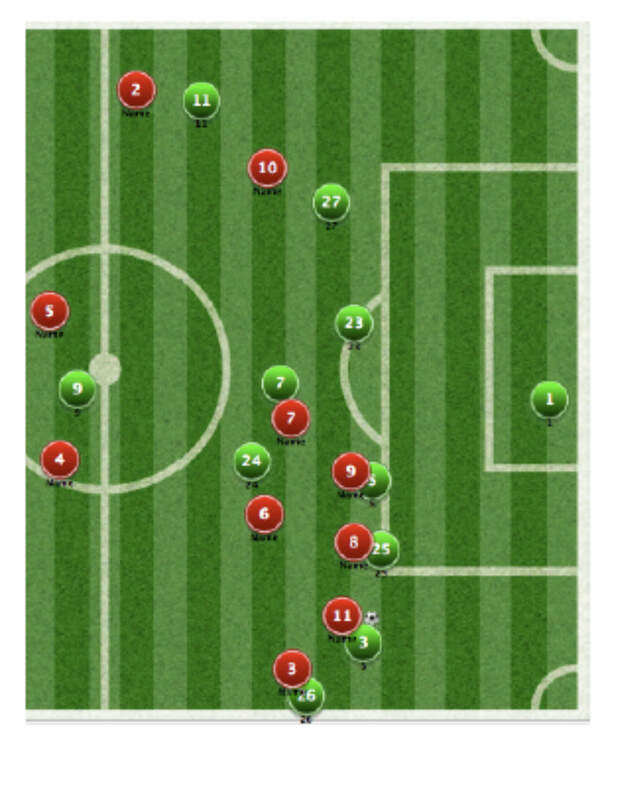 The above image was taken from an excellent article about Brendan Rodgers’ pressing approach and shows just how effective high pressing can be – the left back in the above image is limited to route one or to play the ball back to his goal keeper, who is also likely to play a route one ball. Route one football more often than not results in the ball being turned over back to the defending side. Differences however, lie in the rigidity of structure in formation between total football and Villas-Boas’ approach. Many would argue here that Tiki-Taka is simply a rebrand of Total Football, however there are many differences between the two that have come around as a response to player strengths within a team. Formation: AVB prefers to prepare his team around an axis of three in the middle of the park, each complimentary of one another. Frank Lampard represents a type of player that AVB doesn’t see fit in any one of the three roles. AVB looks to field one defensive minded player and two players who are comfortable at playing further forward in possession, one of whom is still capable of acting as a box to box midfielder. AVB likes players who can defend from the front and attack from the back. Full backs with attacking qualities would prosper in AVB’s tactical approach. While the formation above shows both Modric and Van der Vaart both within the midfield axis, it is likely that Sandro will have a larger role to play. However, during AVB’s Porto days he played both Mourinho and Fredy Guarin in the same midfield – possibly suggesting that given he expects his team to be in possession more often than not, two ball playing midfielders would be acceptable. While the same players are all listed in the formation above as the familiar faces we saw under Redknapp, the most fundamental changes come from the pressing and build up play differences of the two styles of football. AVB’s tactical foundations are based around a fluid passing game but in a strict and rigid formation. He has a track record in showing a belief that players should be selected that fit his system and not a system chosen to cater for the best players. The possible appointment of AVB would represent a move away from Redknapp and his adaptive tactics to fit the best players in a side to Villa Boas’ approach to fit players to a system, a selection of the best team, not players. Clearly, the key for AVB succeeding at Spurs comes down to whether he is able to keep players: Luka Modric and Gareth Bale in particular. Both are players who fall perfectly into place with his tactical set up and as Chelsea saw, it is not easy to implement AVB’s ideas without the correct typology of player in each given role. The philosophy that AVB will propose aims to provide “freedom by design”, freedom of creative football by an implementation of structure. The potential sales of both Bale and Modric however, would not be all doom and gloom as both would demand such large fees, which would therefore allow Villas Boas to actually go out and purchase players who fit his system – an opportunity he was never truly given at Chelsea. Don’t be too surprised to finally see AVB recruit some of his old Porto friends this time around. It is worth reminding yourself however, that Tottenham have a youth player more than capable of stepping up to the big stage next season, a player who fits the creative midfield role like no other english player and impressed from start to finish in the NextGen Series last season: Alex Pritchard. And Villas Boas is not one to be afraid to choose a youth player and allow him the opportunity, after all AVB’s career has been built around opportunities offered to him despite his age, and let us not forget… he is still only 34 years old himself! Categories: Chelsea (NN), EPL Index Featured Article, EPLIndex Tactical Report, and Tottenham Hotspur (NN).' 'Tags: ajax, Andre Villas-Boas, AVB, AVD Tottenham Tactics, Chelsea (NN), formation, hotspur, Manager, NEW, next, passing football, possible, premiership, pressing football, Redknapp, rinus michels, season, Spurs, tactics, team, Total Football, Tottenham, Villas Boas new spurs manager, Villas Boas Spurs, Villas Boas Tactics, Villas Boas Tottenham, and Villas Boas Tottenham Tactics.